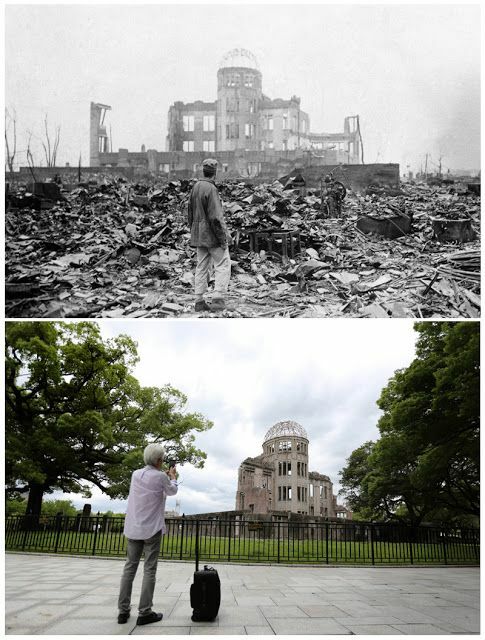 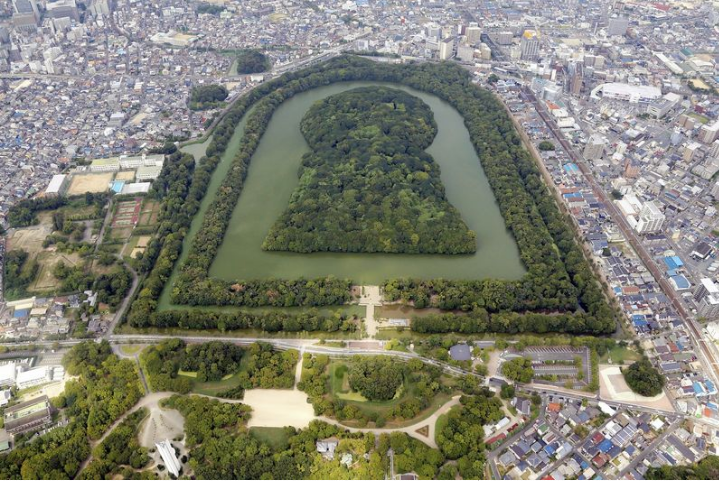 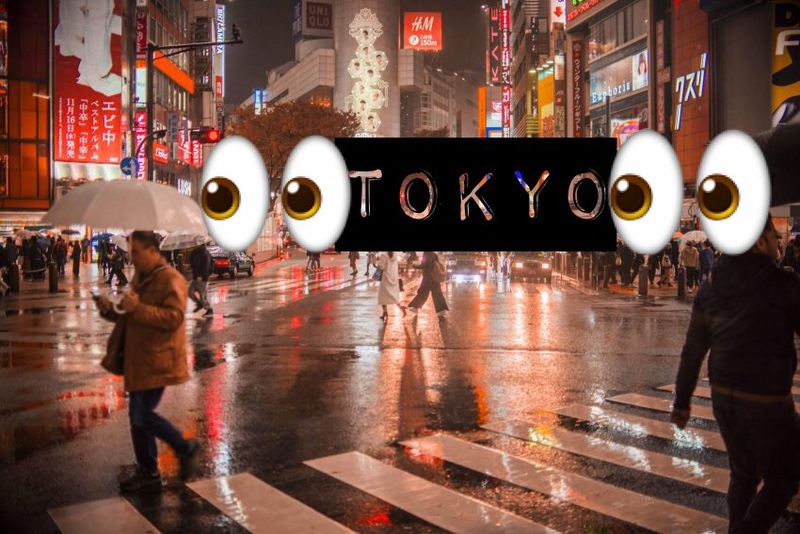 1.The gutted Hiroshima Prefectural Industrial Promotion all – now known as the A-Bomb Dome or the Hiroshima Peace Memorial – after the bombing on 6 August 1945, and the same location near Aioi Bridge in 2015. 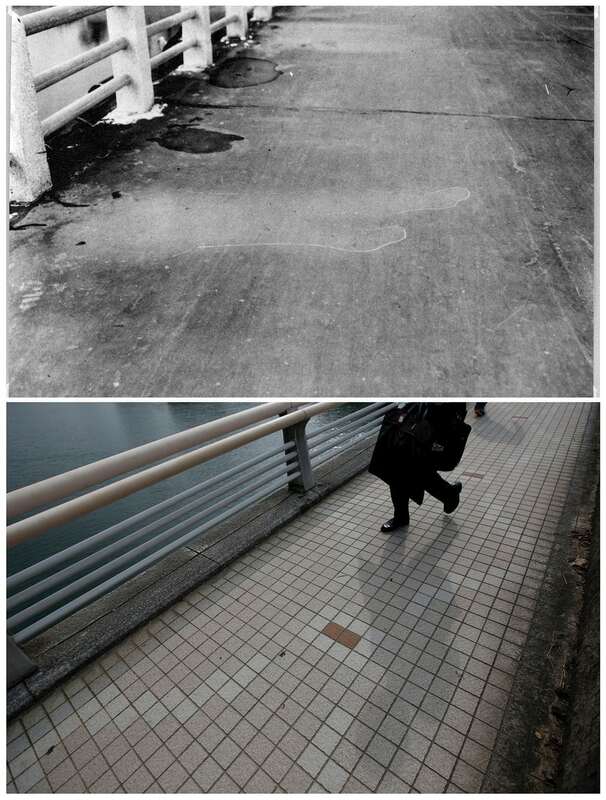 2.The etched outline of a passerby that was imprinted on the Yorozuyo Bridge after the heat of the bomb. 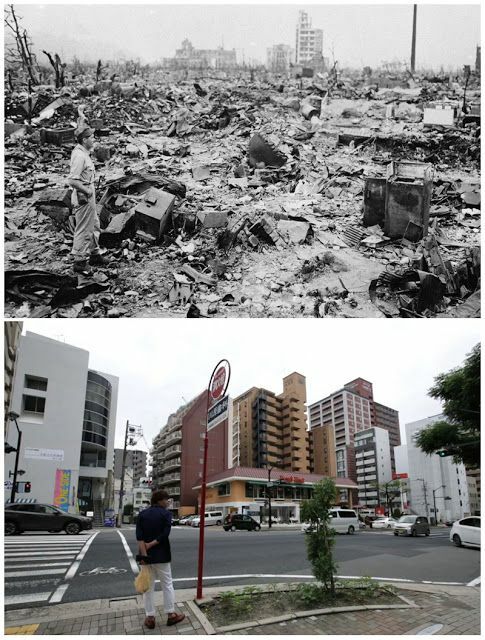 This was 860 metres from the centre of the blast; the asphalt was scorched everywhere except the light area, which was shielded by their body. Today, the bridge has been tiled over. 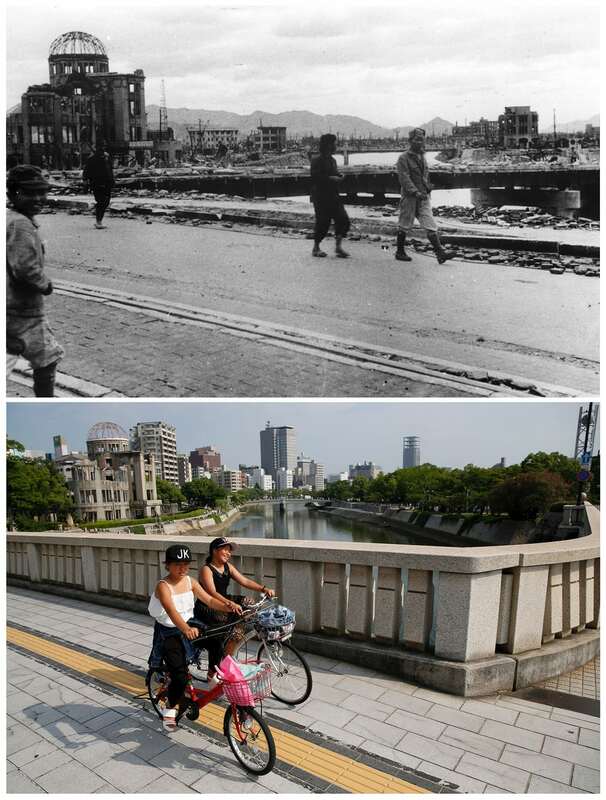 3.Residents walk near Aioi Bridge in Hiroshima, October 1945, and the bridge today. 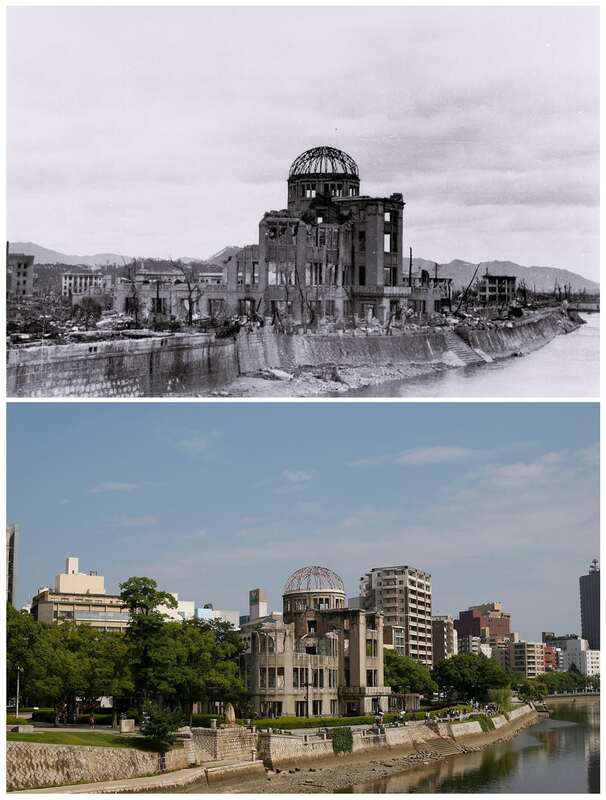 4.People walk past the A-Bomb Dome on the Aioi Bridge. 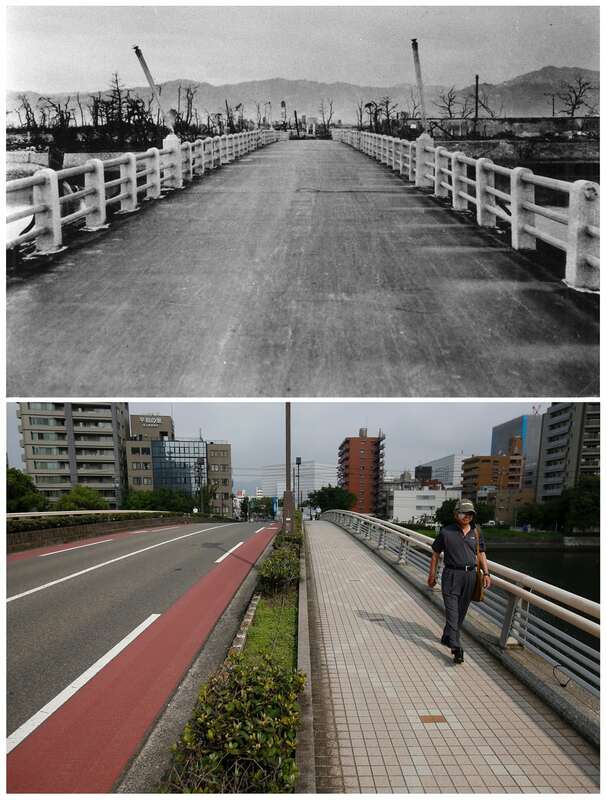 Today, cyclists cross the bridge. 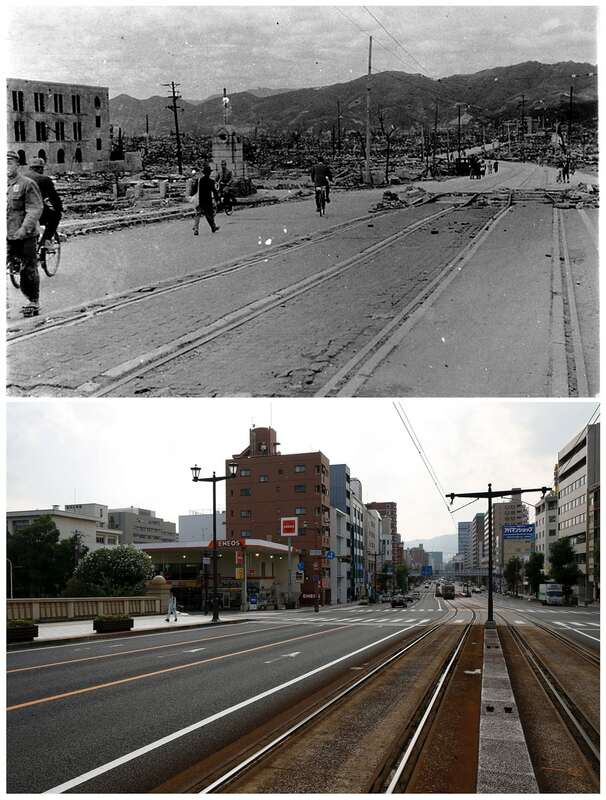 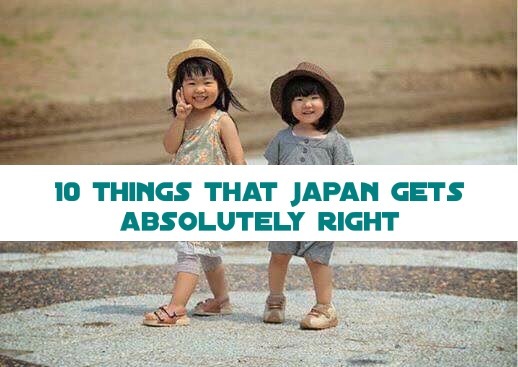 5.The shadows of railings cast on the Yorozuyo Bridge road by the heat of the bomb. 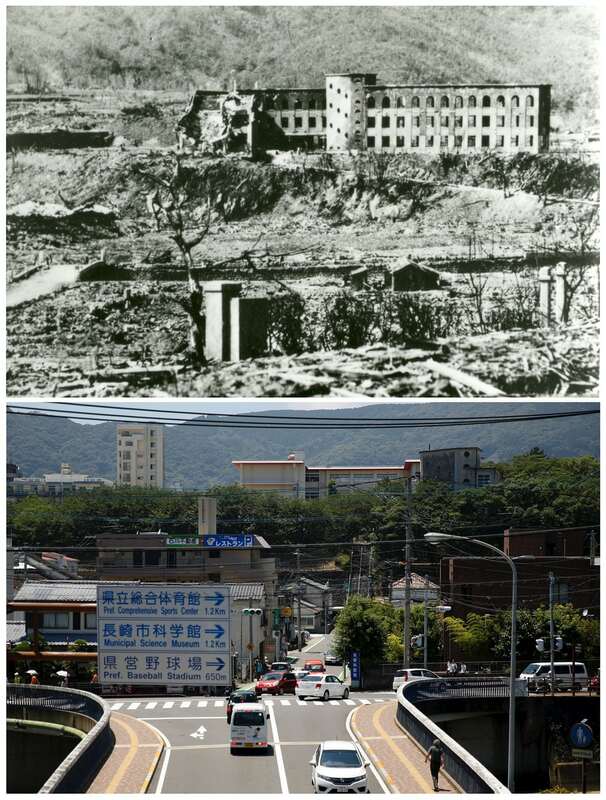 6.The ruins of Nagasaki Medical College after the second bomb was dropped on Nagasaki, three days later. 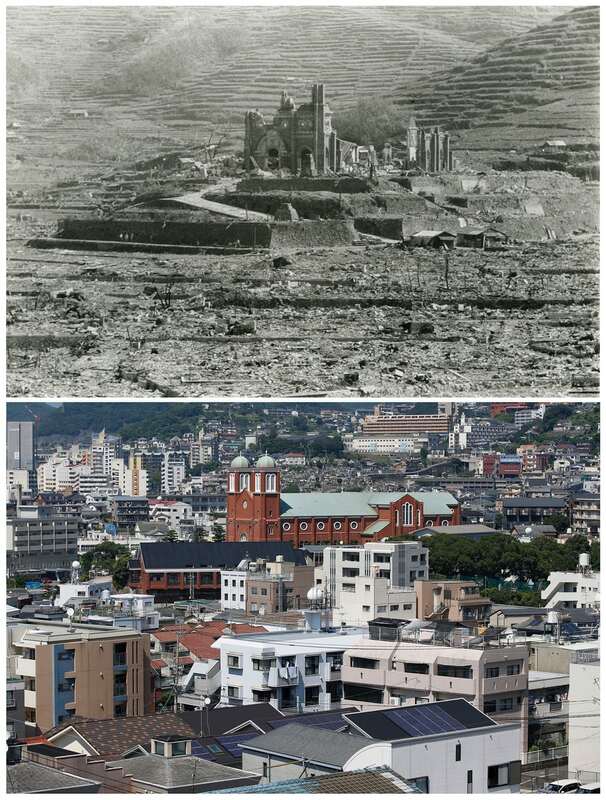 7.The Urakami Cathedral in Nagasaki, which was obliterated on 9 August. 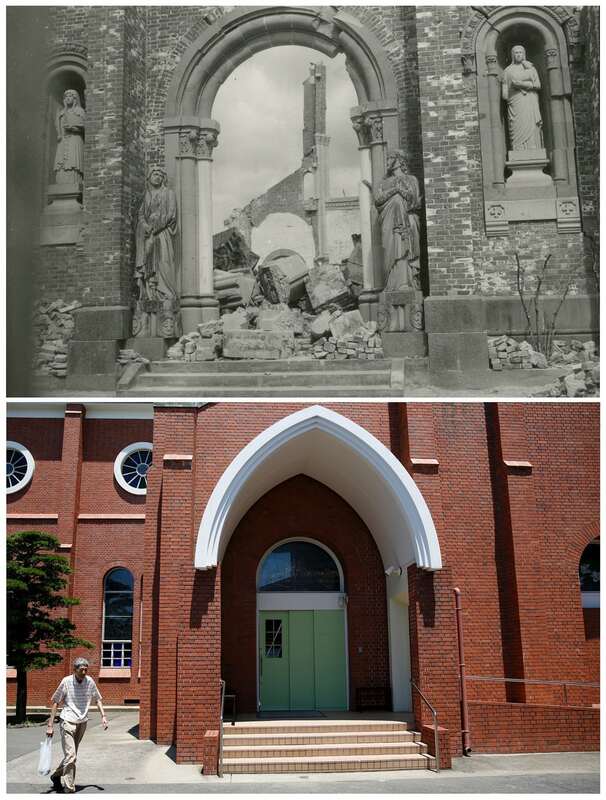 The replacement was built in 1959. 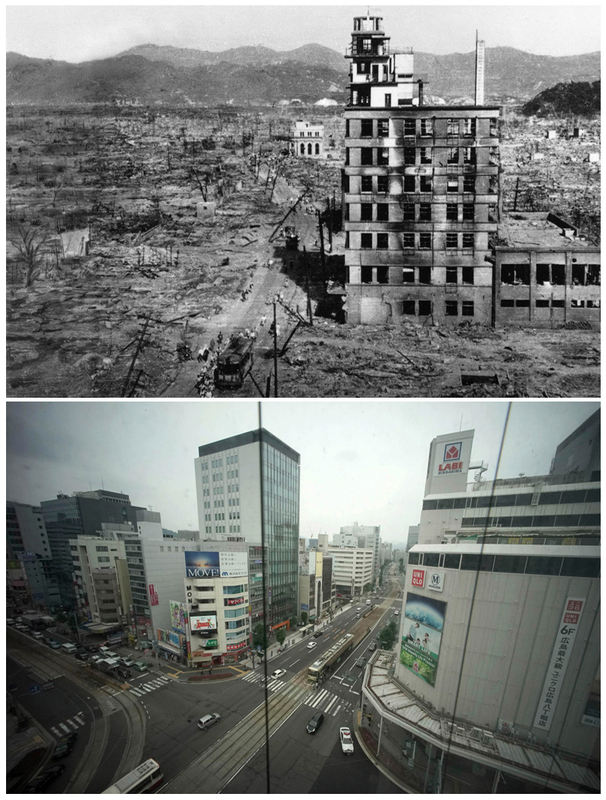 8.The south face of Urakami Cathedral in 1945 – and the rebuilt cathedral. 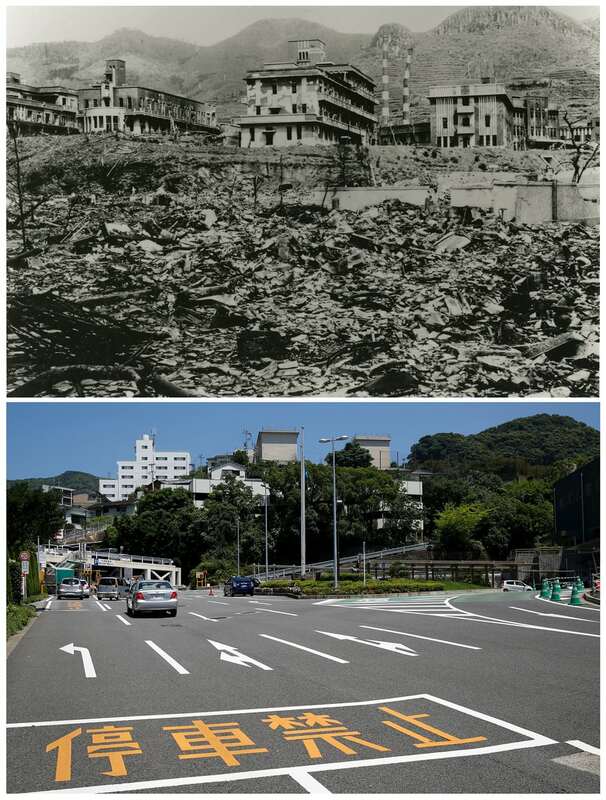 9.The ruins of the Shiroyama National School in Nagasaki, and the same road today. 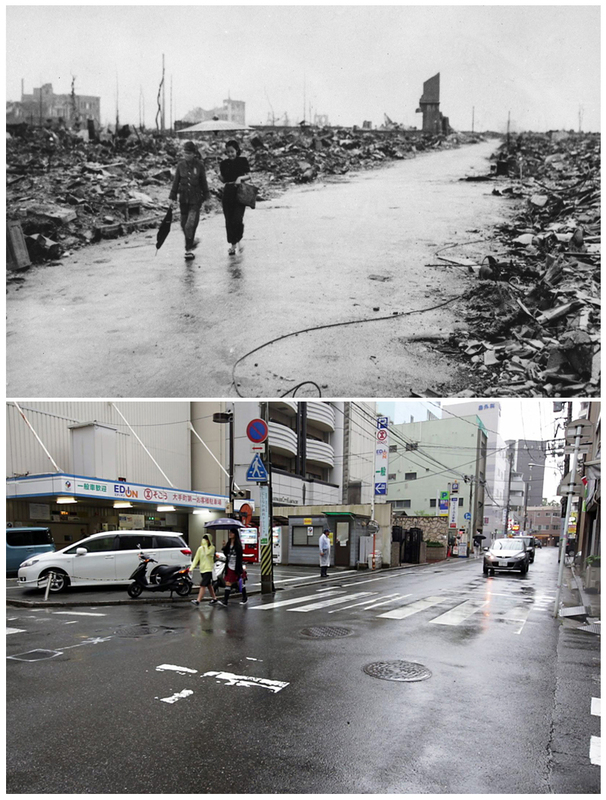 10.Two people walk on a cleared path through the destruction resulting from the 6 August detonation of the first atomic bomb in Hiroshima, western Japan. 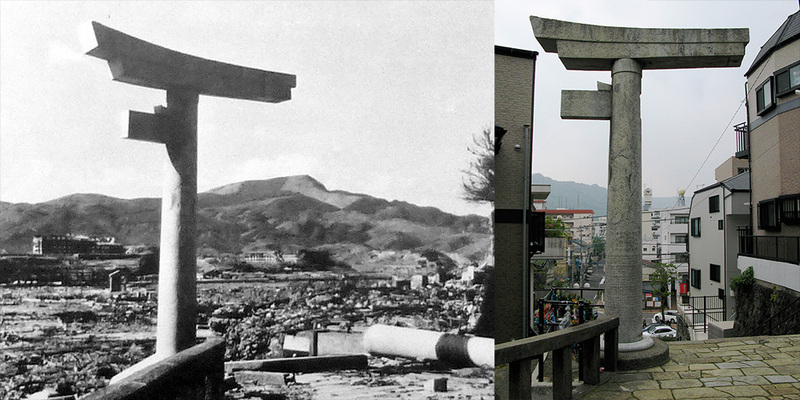 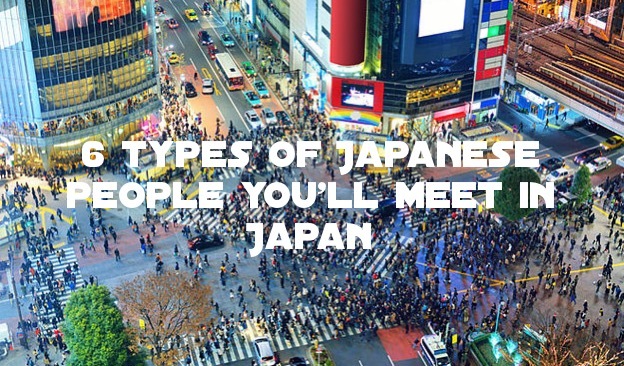 12.the one-legged rubble of a torii — an archway into a sacred shrine— remains at Sannō Shrine to commemorate the day the city was bombed.